Investigate the strange goings-on in Daggerfall. The bustling city of Daggerfall holds many mysteries. It appears that I stumbled right into one of them. Talk to Giblets the dog. Follow Giblets to the river. Talk to the merchants in the Daggerfall Marketplace and at the Tradesman's Square. Meet Grenna gra-Kush at the Rosy Lion. Investigate the inn and the manor. While going through Daggerfall you will probably come across a dog named Giblets. Interact with him and he'll want you to follow him. 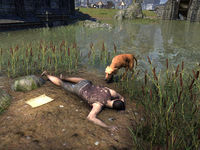 Giblets leads you to a dead body lying in the water with a note near him. Alternatively, the note can be found without involving Giblets; see the section below. Once you read the note you'll get attacked by a Bloodthorn Assassin; kill him. Now head west to the Daggerfall Marketplace and talk to the grocer, Christoph Lamont. Ask him about three blood oranges and he'll tell you it's a phrase used by the King's intelligence network. Now talk to the florist, Diane Guissant, who is in the same area as Christoph. Finally go southeast to the Tradesman's Square and talk to the tailor, Kareem Winvale, inside Winvale's Winsome Loom. He tells you to talk to Captain Aresin by the great stairs behind the Mages Guild. Leave the shop and follow the path west of the shop over the bridge then turn north and continue all the way to the Captain. Speak with him and tell him about Roy (the dead man). He tells you to talk to Grenna gra-Kush at the Rosy Lion Inn. Go north down the stairs and head for the inn. Inside, go to the fireplace and talk to Grenna. She says one of the Bloodthorn is upstairs and maybe you can get him to talk. Go upstairs and confront Leveque. When you get close a cultist attacks; kill him and talk to Leveque. He tells you Martine Lerineaux hired him and that Martine lives in the big house next to the inn. Go downstairs and talk to Grenna near the fireplace again. She tells you to get into Lerineaux Manor and take anything you find to Aresin. Leave the inn and go northeast to find the entrance to his manor. Enter the manor; the ground floor doesn't have much besides containers with provisioning items and style materials, so, head upstairs. Go to the end of the hall and kill the enemies. At the end of the hall in the room on your right you'll find Martine ready to fight. Defeat him and then grab the note on the table. Bring the evidence to Captain Aresin to get your reward and start the next quest. This will initiate the Daggerfall objective and the quest. This page was last modified on 3 February 2019, at 23:30.